It was fifty years ago today- October 3, 1968 American Independent Presidential candidate George Wallace named former Air Force General Curtis ‘Bombs Away” LeMay as his running mate. It would be a decision Wallace would immediately regret. 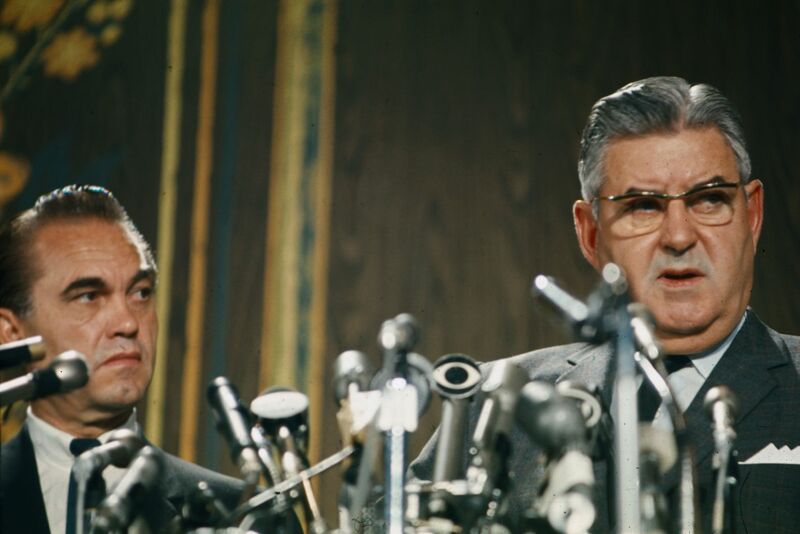 The picture above is from the news conference announcing LeMay- they had briefed LeMay who was a loose cannon about what to say and what NOT to say- but it did no good. If you watch the footage of it you can see Wallace in the background and he looks stunned at what he is hearing. LeMay said that although he didn’t believe that nuclear weapons would be necessary in the Vietnam War, he wouldn’t be opposed to their use. “It doesn’t make any difference to the soldier whether he is killed by a rusty knife or a nuclear explosion, In fact, I’d lean toward the nuclear weapon.” Wallace’s hope in the election wasn’t really to win- he wasn’t going to but to win enough electoral votes so no one had enough to win- then he’d be someone who would yield power. LeMay played little role in the campaign after this and was sent off to places where his remarks wouldn’t received much attention. Sometimes life is stranger than fiction… I can’t imagine what was going through Wallace’s head…a rusty knife might have been one thing.